You may remember a post from earlier this week when I mentioned that I had been bargain hunting in charity shops for Number One Son’s return to Uni. 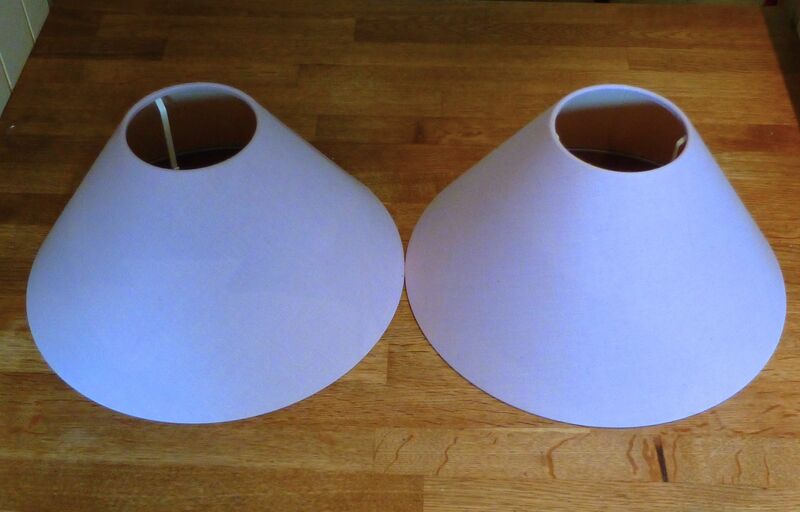 Part of our haul included two utterly minging shiny brass-effect table lamps complete with two equally vile lilac lampshades. I snapped them up solely because they were in perfect working order and only cost a meagre £3.00 in total. No.1 would never have bought them but, as I was paying, he was grateful for anything and I convinced him that we could do something, anything, with them to increase their aesthetic appeal. Quite frankly setting a match to them would make them more attractive so my plan to paint the bases and cover the shades was over and above, I think! 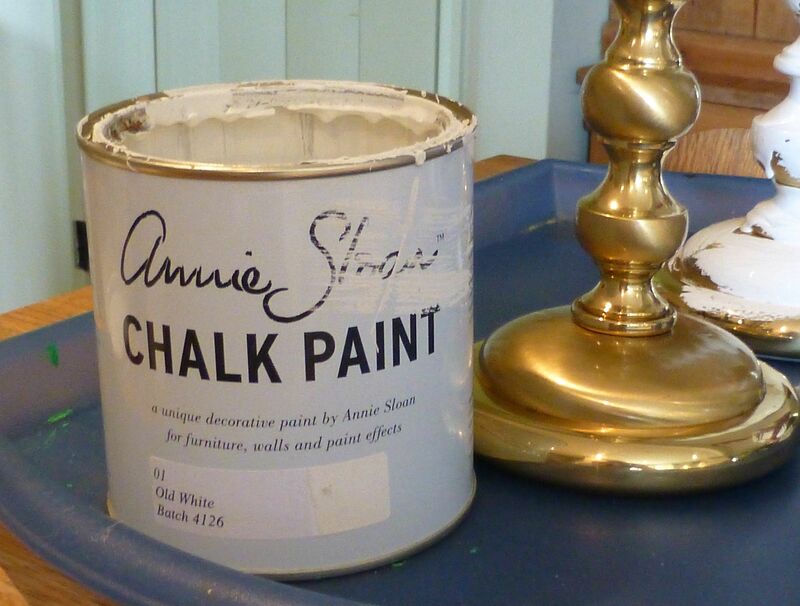 The great thing about Chalk Paints (we used Annie Sloan but Autentico also has an extensive range of colours) is that they eliminate the need for laborious preparation. 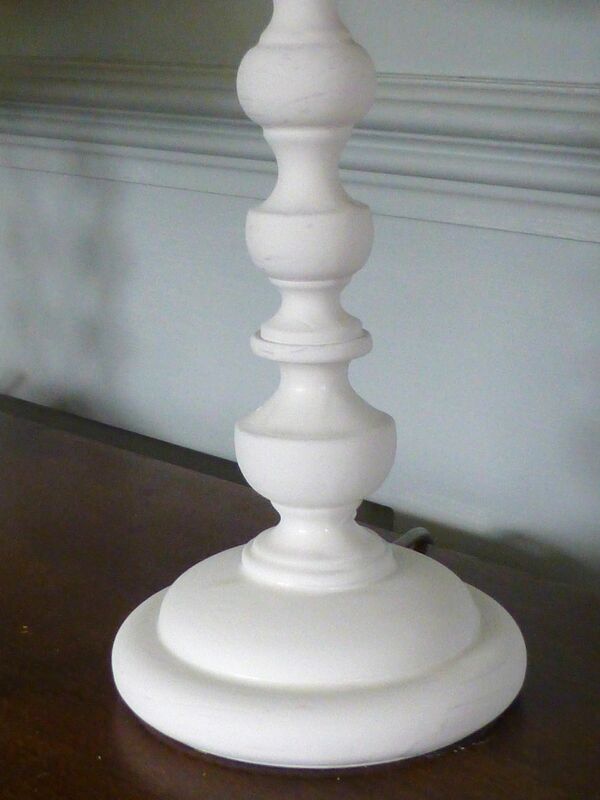 No sanding necessary, just wipe clean and paint – it truly is that simple! 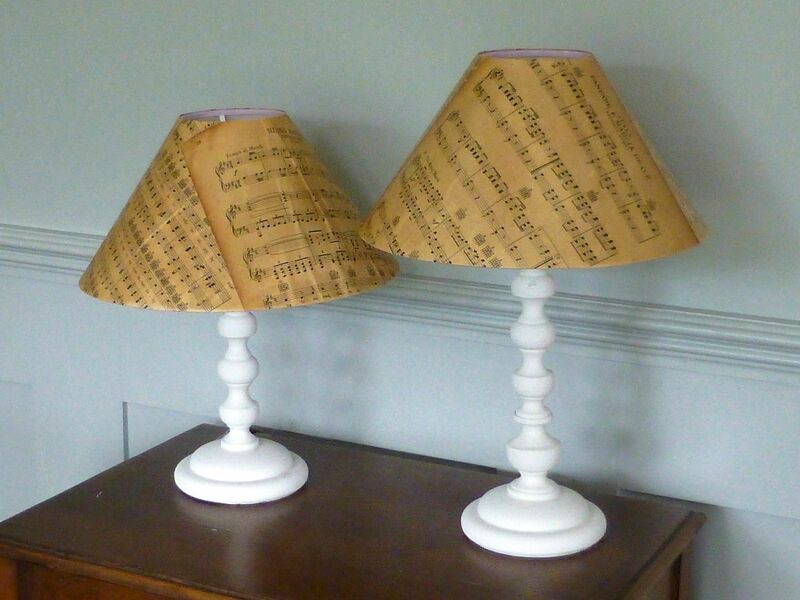 Now to start on the lampshades. 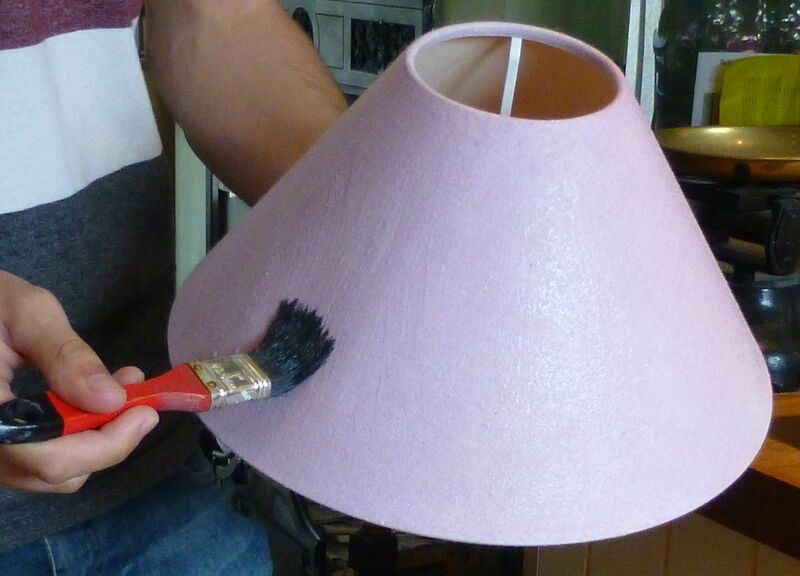 Having mixed some PVA glue with an equal amount of water, it was slopped on the the shades very quickly. 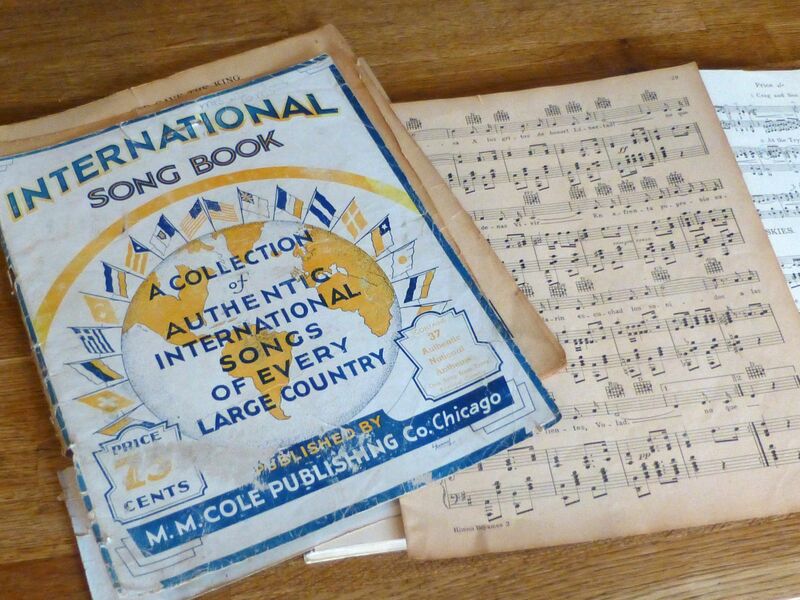 Another charity shop find that I couldn’t resist ages ago was this book of musical scores, each one the National Anthem of a different country. 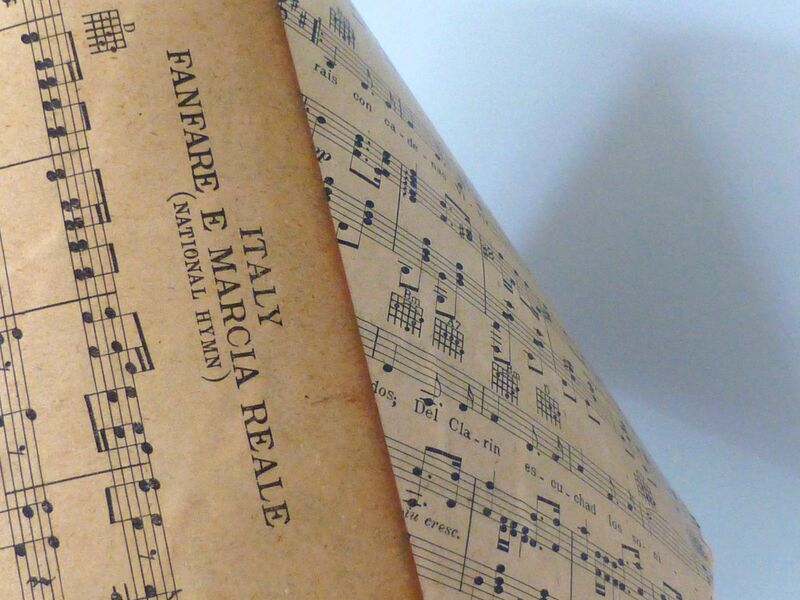 It’s so old that the pages are the authentic tobacco-stained brown that is so often faked with cold tea; a lovely contrast to the white base. 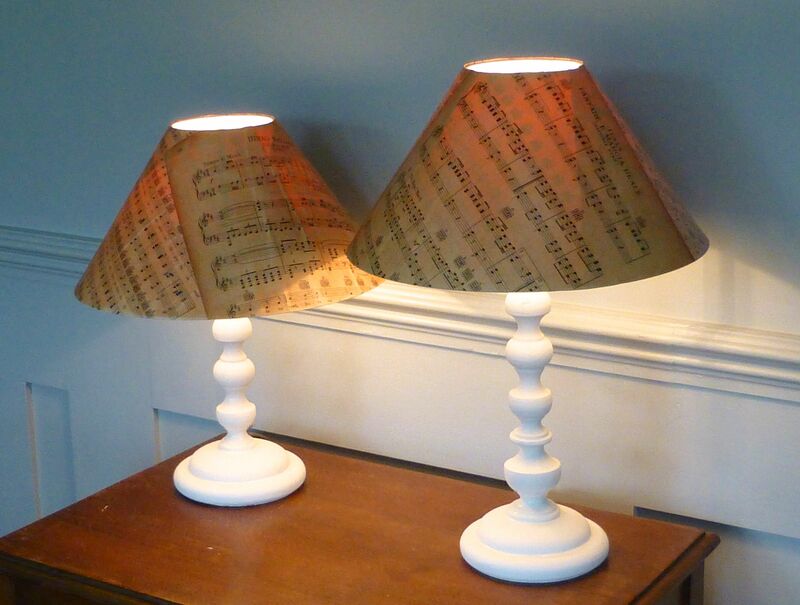 We literally tore pages from the book and pasted them with more PVA onto the shades, smoothing it as we went. Extra pages are slapped on, overlapping where necessary, until the whole shade is covered. 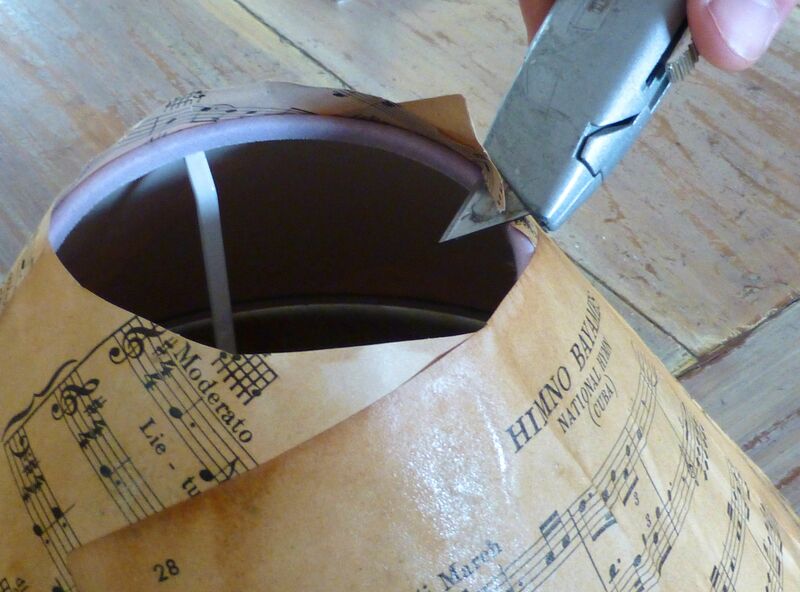 When dry, use a Stanley knife or (similar craft knife) to cut away the overhanging edges. 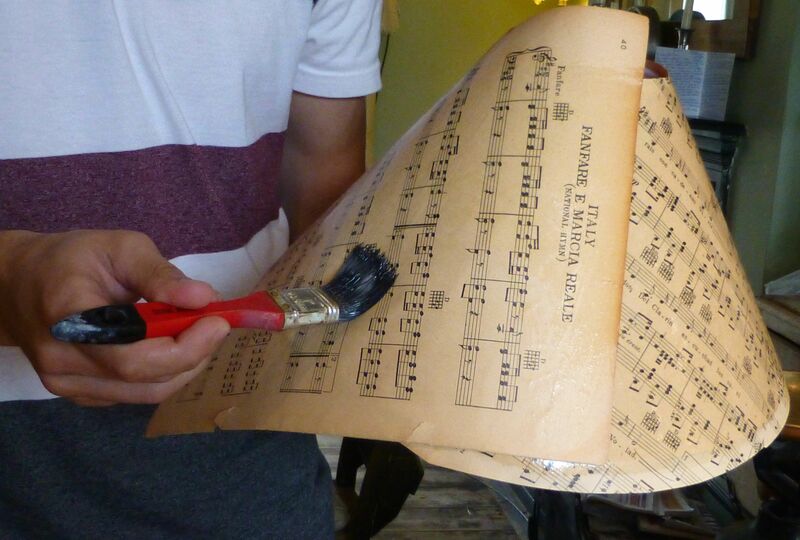 (Tip: make sure you use a fresh blade or you risk ripping the paper). I can’t wait to show you the result so, without further ado…..
No.1 is understandably chuffed with our efforts and I think they will add a cosy touch to his Uni digs. They look especially lovely at night time. It’s amazing what you can do with very little cash and lots of imagination, isn’t it? 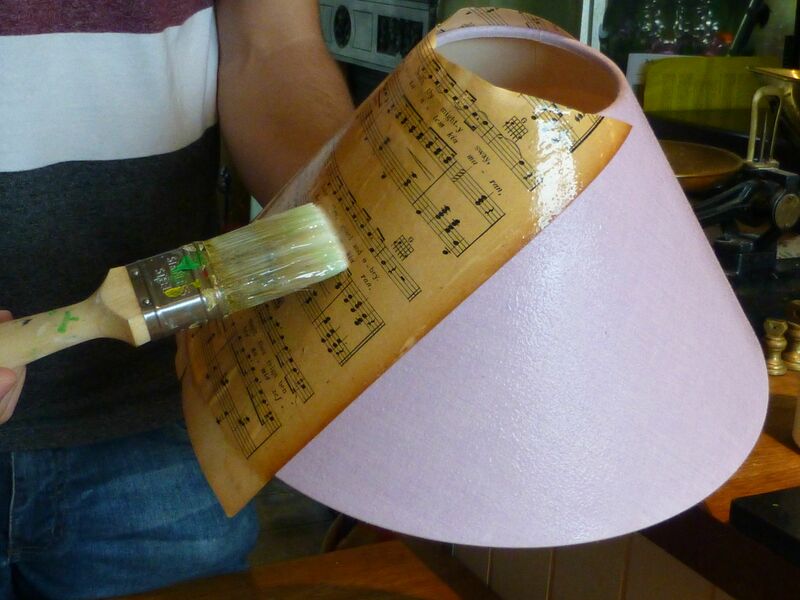 Categories: Crafts, Tutorials | Tags: Annie Sloan, chalk paint, cover, how to cover a lampshade, lampshade, table lamp, upcycle | Permalink. He’s far too polite to say that but I’m sure that’s what he was thinking. He trusts me to know what I’m doing luckily! Thanks! Yes, I recall seeing it; maps were my first thought until I remembered the music scores. These are fantastic! They look so clean and modern. I think you can appreciate the shaping of the base more now, too. Great up-cycle. And if they do get bashed a little, it’ll only add to their charm. 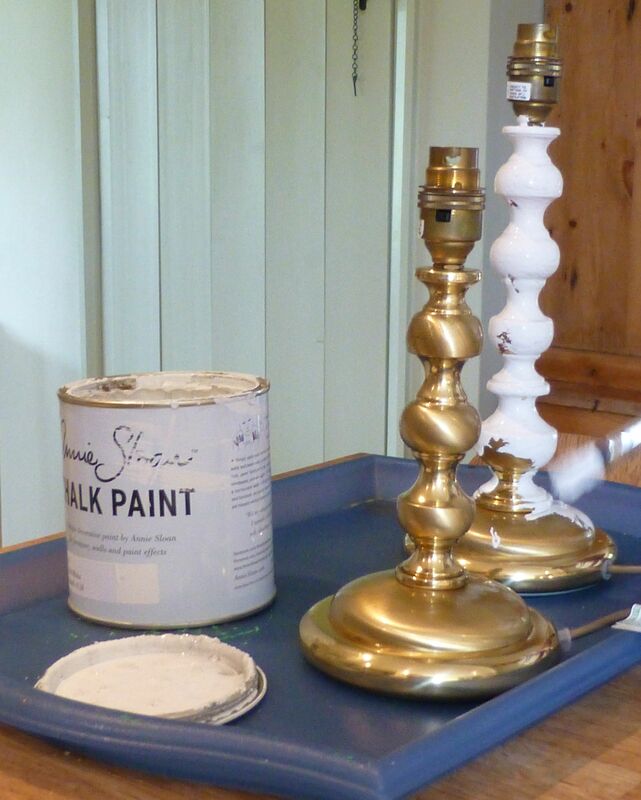 We saw a huge display of this paint in our new local vintage coffee/gift shop. There is not a lot that you couldn’t paint with this stuff! I know, it’s great stuff – you can even paint fabric with it apparently!